Since our inception in 1978, the Angel Society of Fallbrook has contributed more than $3.8 million in charitable giving to the greater Fallbrook area. 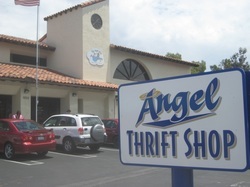 Funds are raised through members’ dues, donations and many hours of hard work in the Angel Shop, our all-volunteer managed thrift store in downtown Fallbrook. Members of the community are encouraged to donate gently-used clothing, accessories and shoes for men, women and children; household goods, collectibles, small appliances to the shop during its regular store hours between 10 a.m. and 2p.m. Monday through Saturday. The store is closed Sunday. Monetary donations are also gratefully accepted. Donations received from past benefactors made it possible to purchase our building at 1002 South Main in downtown Fallbrook. At that time, a special Building Fund was also created for maintenance and necessary upgrades to our building, as well as additional principal payments. We hope you will consider making a tax-deductible donation to our Building Fund or to the Angel Donor Wall, which is on display at the entrance to our building. Please take a moment to donate here or you may download our donation form, which should be mailed with your contribution to the Angel Society of Fallbrook, P.O. Box 1408, Fallbrook, CA 92088. Thank you for your continued interest and support, which is so vital to the success of our organization. The Angel Society is a 501(c)(3) non-profit corporation. All gifts are tax deductible.